Cell wall glycopolymers on the surface of Gram-positive bacteria are fundamental to bacterial physiology and infection biology. These structures have also gained interest as vaccine antigens, in particular for the human pathogens Group A Streptococcus (GAS) and Streptococcus mutans. 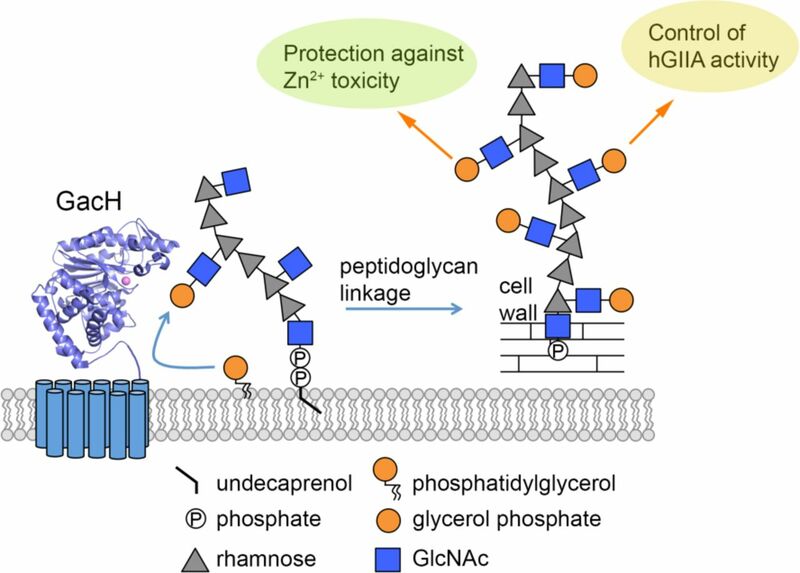 Streptococcal cell wall glycopolymers are considered to be functional homologues of wall teichoic acids but surprisingly lack the biologically-relevant and characteristic anionic charge. Here we identify gacH, a gene of unknown function in the GAS Group A Carbohydrate (GAC) biosynthetic cluster, in two independent transposon library screens for its ability to confer resistance to zinc and susceptibility to the bactericidal enzyme human group IIA secreted phospholipase A2. To understand the underlying mechanism of these phenotypes, we determined the structure of the extracellular domain of GacH and discover that it represents a new family of glycerol phosphate (GroP) transferases that is evolutionarily distinct from lipoteichoic acid synthase. Importantly, we demonstrate the presence of GroP in both the GAC and the homologous Serotype c Carbohydrate (SCC) from S. mutans, which is conferred by gacH and sccH products, respectively. NMR analysis of GAC released from cell wall by non-destructive methods reveals that approximately 30% of the GAC GlcNAc side-chains are modified by GroP at the C6 hydroxyl group. This previously unrecognized structural modification impacts host-pathogen interaction and has implications for vaccine design.